While Pinterest often takes the title as the best digital mood board for wedding inspiration, digging through photos to curate your own boards can become a bit overwhelming. The solution? Turn to Instagram, where wedding inspiration is only a swipe and a tap away. We’ve compiled our favorite Instagram accounts that every bride-to-be should be following — besides Bridal Guide, of course! — to spark her wedding planning. Written Word Calligraphy is bound to fulfill every stationery enthusiast’s dreams. Karla Lim, the talented calligrapher and designer behind the studio, aims to create modern calligraphy and illustrations without sacrificing elegance. Her feed is more than just dreamy and romantic invites and paper goods; Karla also leaves her handwritten art on everything from linen seating charts to wooden signs. If you’re looking for décor ideas, you can’t go wrong by following San Francisco-based Laurie Arons Special Events. 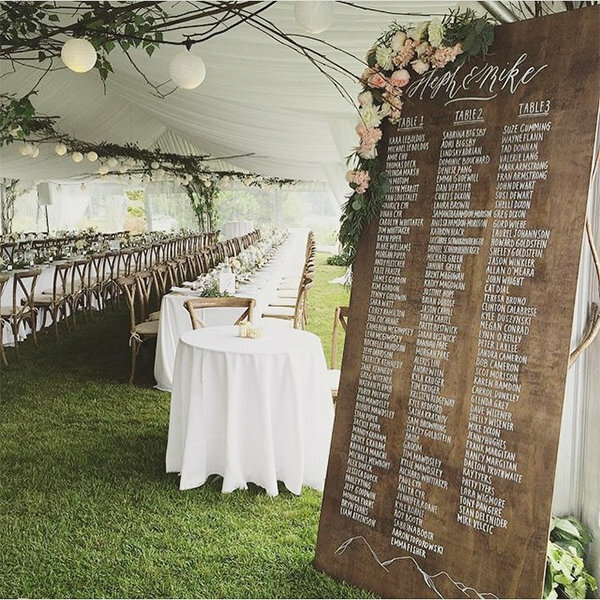 Her feed is a virtual treasure-trove of jaw-dropping reception tents, striking tablescapes, and all the details that make a wedding special. Her creative design is stunning; just a quick browse through her Instagram feed, and you’ll be in full-blown planning mode. Give your 'maids the attention they deserve with help from Bella Bridesmaids. A goldmine of stylish bridesmaid dresses, this account will have you double-tapping its variety of colors and styles. You’ll be able to decide once and for all whether you want to opt for a bold fuschia versus soft neutrals or mix and match versus keeping it traditional. You’ll want to take a bite right out of your phone while looking at Stevi Auble’s sweet confections from Hey There, Cupcake! Stevi proves that cake is more than just food — it’s also an art. Geometric designs, mixed metallics, vibrant colors, and fun flowers give "eye candy" a whole new meaning. Be Inspired PR's feed is just plain fun. Whether it’s a shot from an inspiration shoot or a favorite wedding photo, the snapshots provided by this boutique wedding and lifestyle PR agency are sure to help you complete your wedding vision, from perfecting those tiny details to discovering new ceremony and reception ideas. Wedding Sparrow is a dreamy fine art wedding blog that focuses on film photography. Its carefully curated Instagram feed is nothing short of stunning, emitting hints of boho, vintage, and romance. With shots of ethereal bridal dresses and gorgeous vistas, you’ll get lost in a sea of artistry and creativity. You won’t want to decide on your dinnerware and tablescape until you’ve consulted luxury tabletop rental and design company Casa de Perrin’s board. These tabletop crafters have curated extensive collections ranging from vintage china to modern ceramics, all while maintaining a timeless aesthetic. Their tabletop details and plate arrangements are a feast for your eyes — even without the food. Consider yourself an anthophilous? Then this Instagram account is for you. With images of blooming bouquets, abundant arrangements, and fresh florals, Atlanta floral and event designers Amy Osaba Events proves why flowers should be the final touch to your big day. You’ll be crushing on one too many color combos in no time. Embellished bodices, lace sleeves, and chiffon trains — Denver’s upscale Little White Dress Bridal Shop has it all. Expect to see a mix of couture gowns from editorials and the runways, as well as sneak peeks of bridal trunk shows, “just in” collections, and real weddings of Little White Dress brides. Their swoonworthy images are enough to fulfill every bride-to-be’s wedding dress fantasy. The breathtaking images from this fine art wedding photographer will make your heart skip a beat. Jose Villa captures beautiful brides, delicate details, idyllic locations, and styled photo shoots, with each image more captivating than the next in a board brimming with beauty.